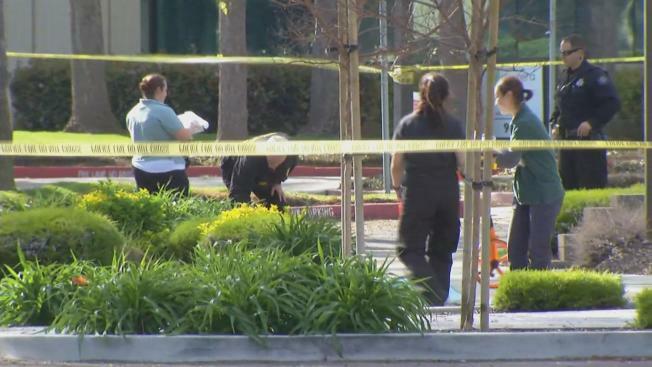 A domestic dispute and ensuing police pursuit ended with a man fatally shooting himself in Redwood City on Tuesday, police said. An armed domestic violence suspect showed up at his ex-wife's place of work at around 2:20 p.m., even though she had been granted a restraining order against him, police said. The woman immediately called police when she saw the suspect arrive at her work at a business park off Seaport Boulevard. After she refused to talk to him, the man grabbed a gun from his truck and chased her through the parking lot, police said. Dispatchers said they heard a gunshot while they were on the phone with the woman, who was not hit. When officers arrived, they were able to confront the man about a block away. Police said after a brief negotiation, an officer fired one shot, and then the man shot himself. "I'm told during the exchange he pointed at officers," Redwood City police Chief Gary Kirby said. The man was pronounced dead at the scene, and it was not immediately known if the shot fired by the officer hit him. Police said the suspect was arrested less than two weeks ago in a domestic dispute and tried to break into his ex-wife's home the day after. They said he was not allowed to carry a gun. "They knew that they were basically working with an individual who was not of his right mindset because he was confronting his ex-wife in a volatile manner," Kirby said about responding officers. Several workers in the area said they were put on lockdown during and after the chase and shooting. No other injuries were reported. Police Investigating a shooting near Penobscot and Saginaw. No public safety threat at this time. Westbound Saginaw at Penobscot is closed while we investigate.